Selawik, Alaska, is a second class city of 829 persons. Selawik is located at the mouth of the Selawik River where it empties into Selawik Lake, about 90 miles east of Kotzebue. The Selawik River is navigable from early June to mid-October. Electric power generation was provided solely by diesel generation and fuel barge deliveries were restricted to the short navigable period or fuel had to be flown in when storage ran short. 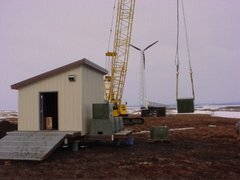 Alaska Village Electric Cooperative (AVEC) installed 4 wind turbine power generating machines on structural steel towers which were integrated with the local diesel grid. Accessory systems such as a secondary load and controller, boardwalk access, and a control building were also installed. 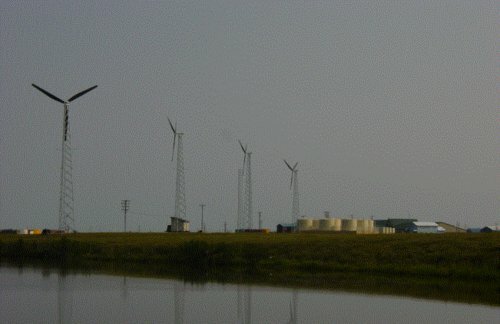 Each of the wind turbines is rated at 65 kW, but may produce as much as 90 kW during sustained high wind conditions. Each of the towers is 80 ft above ground, and support generators weighing about 5340 pounds each. Power conductors were run from each turbine to a control building, where they were integrated with controls to send power back to the diesel power plant to feed to the community electrical distribution system. Wind data was gathered for the area prior to the conceptual design report (CDR) stage; it was determined that the wind regime was slightly better than that in Kotzebue, where Kotzebue Electric Association had already demonstrated the effectiveness of wind power generation. It was determined that 3 turbines would be developed along with a foundation for a fourth generator, the capitalization of the fourth generator would prove cost effective since equipment was already on-site for erection. The project includes installation of a 140 kW electric hot water heater (boiler) and secondary load controller as part of the major overall installation of four wind turbines. The water heater and the load controller should absorb excess energy generated by the wind turbines during periods of low village loads. The secondary load controller shunts electricity that is excess to the diesel grid to the electric water heater which then supplies the hot fluid to the secondary district heat supply circuit that sends recovered heat from the diesel plant to the local water treatment plant. The calculations of output, given the assumptions and calculations at the time, was estimated to be 139,000 kWh annually (536,000kWh) for each machine which was then estimated to displace a combined total of 39,000 gallons of diesel annually. To view project reports and other information, visit the Selawik project information in the Denali Commission project database. Funding was provided by a Denali Commission grant to AVEC and cash contributions from AVEC. Expenditures: $989,110.00 from Denali Commission funding and $325,902.00 from other funding.